We don't eat a lot of pastry and so I just keep some frozen pastry in the freezer for times when we fancy a quiche or pie. However, I fancied some kind of egg and bacon pie and the freezer was looking grim. 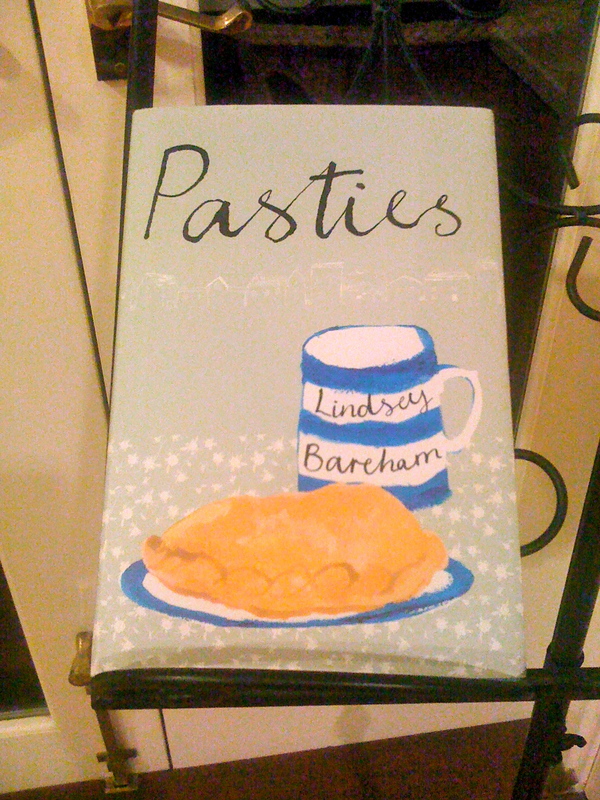 I bought a lovely little book last year when I was visiting Books for Cooks at Notting Hill in the UK, called Pasties by Lindsey Bareham. I have made a few pasties from this book and they hardly touch the plate and they are gone. I put this mainly down to the melt in the mouth pastry. So I turned to Lindsey's book for the right measurements to make perfect shortcrust pastry. This is a great little book with little stories and history about the origins of all the different pasties. 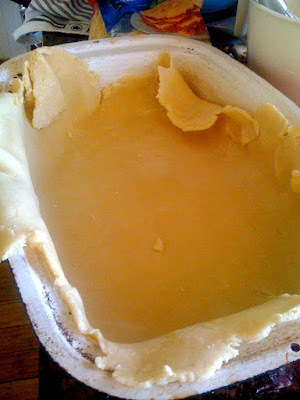 Cut the lard and butter directly into the flour in small chunks and rub into flour until it becomes breadcrumbs. Add water a little at a time using a rounded knife until it resembles a clump. Knead a few times and pat into a ball, cover and leave for 30 minutes. 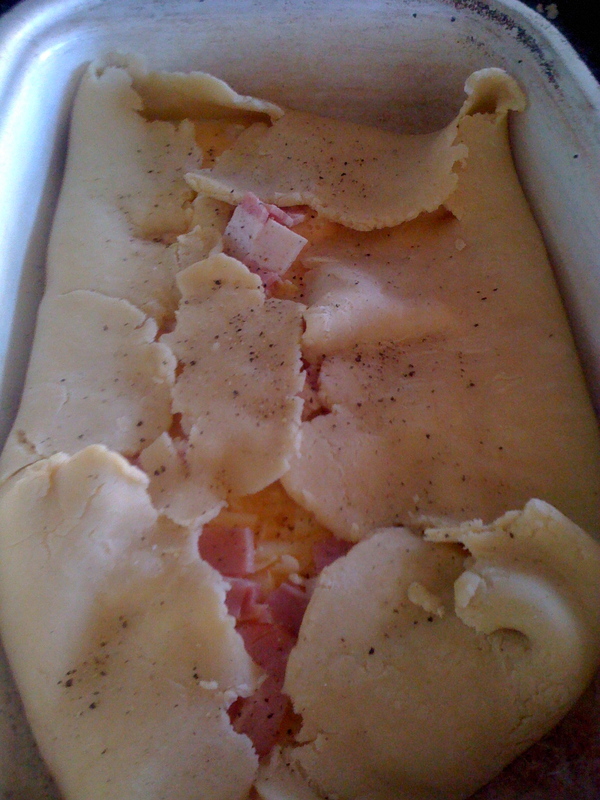 Roll pastry out (not too thinly) to the size of your baking pan, mine was quite deep. As this is a peasant pie you don't have to be too particular how you roll out the pastry, just keep your board well floured so it does not stick, and don't roll it too thinly. Grease your tin and lay in the pastry. 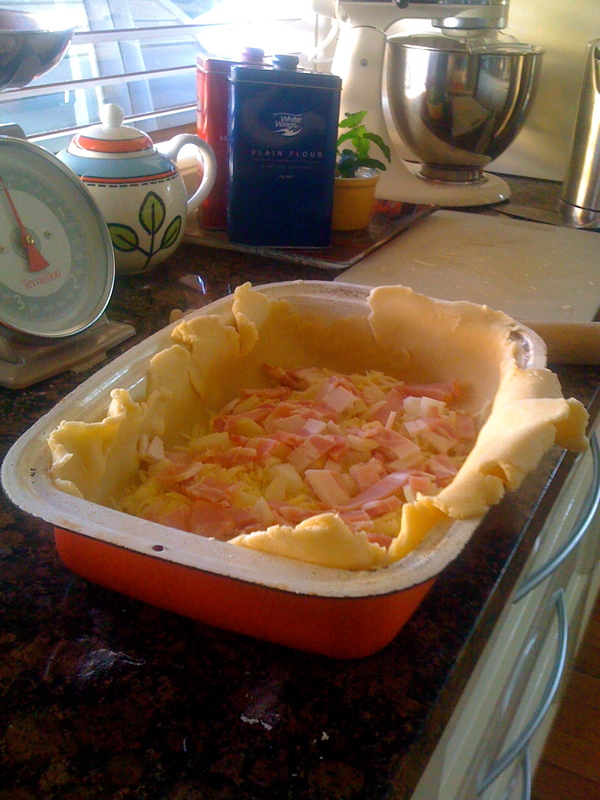 Sprinkle cheese on the bottom of the pie followed by bacon and onions. Pour over the eggs and milk mixture. Cook in a pre-heated oven 200C/400F/Gas 6 for 35mins or longer depending on your oven (insert a knife to see if inside is cooked - it should come out clean). This feeds 6 hungry diners or 8 as an entrée and let me say it wont last long! Thanks Jude - it was delish and we ate more than we should. Books for Cooks is great - next time we visit I am going to do one of their cooking classes. Wow what a lovely memory Charlie. Its going to be a hot and windy weekend here in Melbourne - have a good one too. I want to see a finished photo! As you know, I love anything bacon - this looks like a great Saturday evening supper - not too much effort involved for a great reward. Jennifer, sorry about not showing a finished photo, we eagerly ate it and I forgot, might have to take one of the leftovers and post later. Ooops! How lovely of you to visit my blog....and I really like the look of this peasant pie.....will give it a try before I head off to Gay Paree!! P.S. The Women's Weekly Cookbook is an oldie...but a goodie...isn't it? A bientot/see you later. This pastry is really worth making, hope you visit again soon.